Posted by rawkfistmusic in 2009, Marianas Trench. Admittedly, I’ve never been shocked to find I absolutely adored an album from a genre in which I would normally find such an album. It’s hard to be astounded by the quality of albums from Shinedown or Breaking Benjamin when, quite frankly, that’s the music I most enjoy. Mind you however, it’s not my agenda to discriminate albums based on genre, and thank the heavens for it too. 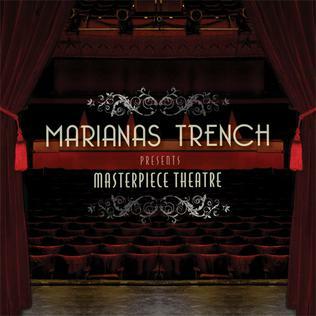 If I did, I may never have delved into Masterpiece Theatre, the sophomore release of the Canadian foursome known as Marianas Trench. And that would have been a tremendous shame. I know what you’re thinking as you rev up Masterpiece Theatre for it’s opening spin. The title track (part 1 of it anyway, I’ll get to that) sets you down in a theater with the warm up of an orchestra playing into your ears, before all sound dies off and leaves you with a Capella group vocals. This lasts for several seconds, and the unconventional voices may make the traditional rock listener feel a bit uncomfortable. Do not fret, the ears adjust, and they adjust well. Frontman Josh Ramsey takes over the song with an explosive and ridiculously catchy chorus, and you quickly get wrapped up in the elaborate work known as “Masterpiece Theatre I”. There are three parts to the title track which take place at the beginning, middle, and end of the album, and provide the backbone of the entire album. The recurring lyrics and tunes never wear thin, but instead have you singing along by halfway through part 2. It sounds crazy, but even though it is in concept the same song three times, it’s still fresh and different all three times, and repeated listens will hold true to this form. Enough of the title tracks, what of the rest? Well, if you enjoyed that first bit, you’re in for one hell of a ride. Introducing “All To Myself”, a shoulder bumping jam that may be among the catchiest on a very catchy album. Try your damnedest, you’ll never get the chorus out of your head, thanks in part to the fantastic pacing of the song and the quickly growing appeal of Ramsey’s vocals. There’s an unconventional sound there, but there’s no doubt that the man is talented, and the varying tones and ranges of his voice provide enough of an experience in itself. “Cross My Heart” keeps the train moving as a finger-snapping, toe-tapping, power pop rocker with a genuinely upbeat pace. That’s a lot of description for a song for sure, but it deserves it all and so much more. As I write this review I’m still wrapped up in this song as it blasts into my ears at full volume. Excuse any typos that may occur throughout this review because of this very problem. It’s just so damn hard to focus with this kind of infectiousness everywhere I tune my music player. Crash back to Earth for a bit, since we must, and feel free to experience “Beside You” which adds harmonization to a wonderfully slow track. “Good To You” however serves as the album’s biggest ballad, with plenty of thanks going to guest vocalist Kate Voegele. It’s heartfelt and passionate at every turn, and I dare you not to get caught up in the emotion of both Ramsey and Voegele as they belt out this number. Other songs like “Celebrity Status” and “Sing Sing” go along well with the theme of previous tracks in daring the listener to avoid dancing. Honestly, the majority of this album is nothing more than powerful pop rock, but I find it hard to believe anyone could fail to enjoy it. The songwriting here is brilliant, as not a single song will fail to grip the listener, and the lyrics are far and away better than the typical rock mold. On top of that, there’s plenty of backup vocal support to add even more upbeat fun to the fantastic singing dynamic, and instrumentally there is a ton to be heard, especially on the drumming front. Truth be told, every time I’ve listened to Masterpiece Theatre I’ve attempted to find a flaw or two in the disc. After hitting double digits in listens, I’ve concluded that mid-album piece “Acadia” is fairly average. Yes, average. It’s not bad, it’s just not brilliant, and it’s probably the only thing here that isn’t. No offense but is Sparky ever gonna write another review?